Kyodo News reported today that a Genkai nuclear power plant reactor in Saga prefecture, Kyushu, was stopped due to an “abnormality”. Radioiodine disappears quickly so this comes from “fresh” nuclear reactions (half-life is about 8 days). Of course, Kyushu Electric Power denied any radiation leak in the Kyodo article. 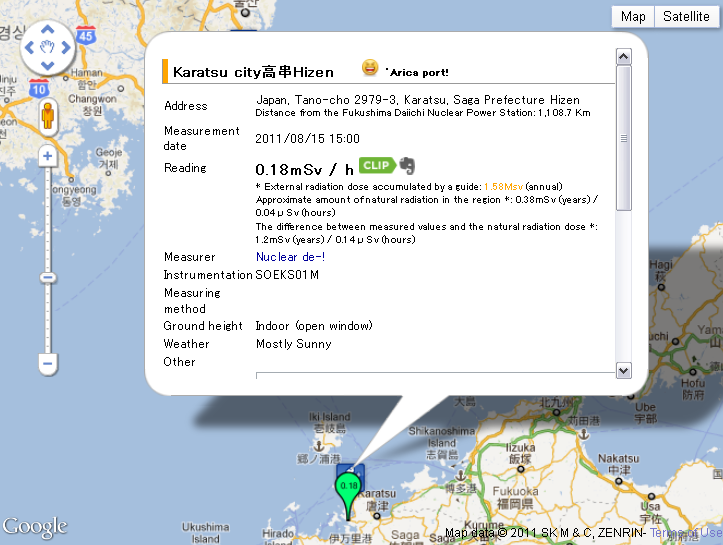 Genkai nuclear power plant is located near an island named Fukushima (sic) and the readings for Nagasaki city above are from about 60 km away as can be seen on the map of Kyushu below (Kyushu is the large southern island in our monitored land). 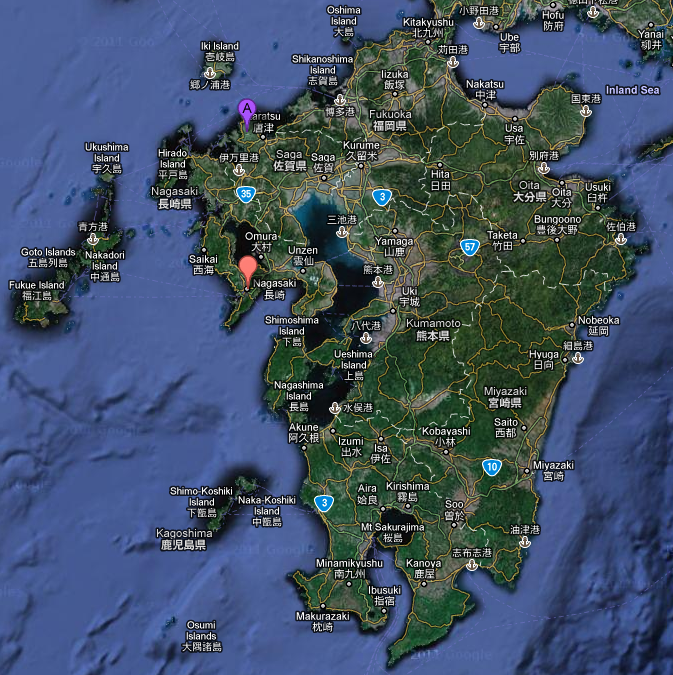 The letter ‘A’ marker in purple locates Genkai and the red one Nagasaki city. In the Karatsu city right next to the Genkai plant, radioactivity was 0.18 uSv/h indoors (open window) so the outdoors, asphalt level could be much higher. Although the unit in the screenshot below is mSv/h, it must be a mistake (green color code is consistent with uSv/h). The blue icon in the background is for the nuclear plant. This mistake in units is unfortunate as it casts a shadow on the credibility of the value, which is the only available in the area. However, if it is to be trusted altogether with information with Fukushima Diary, this is perturbing. This is why more people should monitor the zone. The No. 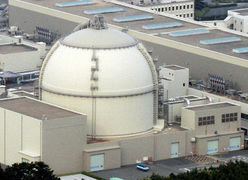 4 reactor at the Genkai nuclear power plant in Saga Prefecture automatically shut down Tuesday afternoon after an abnormality was detected in the steam condenser of its secondary cooling water system, operator Kyushu Electric Power Co. said. The utility said it was investigating the cause and that it believes there has been no leakage of radiation from the 1.18 million kilowatt pressurized water reactor into the atmosphere. No one was injured. The halt leaves Kyushu Electric with only one — the Genkai plant’s No. 1 reactor — of its six reactors in service. The other four have been taken offline for scheduled inspections, and both the Genkai Nos. 1 and 4 reactors are slated for regular checkups in December. A few facts about the Genkai nuclear reactor from Wikipedia dedicated article, and as we can read condensers have met with issues before and Genkai has been the center of scandals and controversies recently. July 17, 1998 there was a leakage in the Condenser of Unit 1 while operating at full power. The problem caused the plant to be run at a lower power for some time. January 20, 1998 In Unit 3 during a routine test, leakage of one fuel assembly was discovered. March 31, 1999 There was a problem in Unit 2 with damage to pressure tubes of the Steam generator. In early 2011, Units 2 and 3 were suspended for routine maintenance. Following the Tohoku earthquake, Kyushu Electric voluntarily sought reapproval with the town of Genkai and Saga prefecture to make sure that there would be no objection to turning the reactors back on. Negotiations extended several months past the normal restart time.Because Units 2 and 3 were not restarted for the summer, Kyushu is expected to have an electricity shortage and only be able to meet 85% of normal summer needs. After the mayor of Genkai extended his approval, the larger consensus of Saga prefecture was sought. A meeting was organized to inform the people in the district and to get permission to restart the reactors. The meeting was broadcast live on TV and the internet, and viewers were invited to submit their opinions by e-mail or fax. However it became known, that the board of the Kyushu Electric Power Company had specifically instructed employees of the plant to sent emails to this meeting with positive mails for the restart. Later was admitted that not only employees of the utility but the workers of 4 affiliated firms too—more than 1,500 people in total—were involved in this. A big scandal broke out in Japanese media, because the whole meeting appeared to be manipulated. At the same time as this crisis broke, Prime Minister Naoto Kan unexpectedly requested more stress tests of the reactor. This seemed to imply, despite the earlier assurances of the national government, that the routine maintenance and additional post-earthquake tests had not been sufficient to clear the reactors for restart, and that the mayor of Genkai had therefore approved the restart without complete information about the reactors’ safety. As a result, the mayor rescinded his approval. The governor of Saga, who had not yet given his approval, also expressed surprise. Chief Cabinet Secretary Yukio Edano flew to Saga prefecture immediately to apologize to the governor in person. On July 9, Kan also apologized. On July 12, actor Taro Yamamoto, a Tokyo native who had flown into Saga to protest the potential restart, broke into the offices of Saga prefecture trying to force the governor to come out. He was unsuccessful but proclaimed that he was glad he had come to protest. On July 20, Shingo Matsuo chairman of Kyushu Electric Power Company announced that Toshio Manabe the president of the firm will resign to take responsibility for problems related to the utility’s attempts to win local approval for restarting two nuclear reactors, and the way in which the results were manipulated. The board of directors’ planned a meeting on July 27 to decide about the punishments for the executives and other officials involved, and the date of the resignation. On July 22 industry minister Banri Kaieda made a comment, “that it is natural for a top official to take the blame“. But Shingo Matsuo denied that the minister had put pressure on Manabe to resign. 2011 November 22: Read an update on SurvivalJapan. so that does mean, Genkai Power plant leaked way before it was announced right ? On the article they said a shut down due to abnormality was announced this very tuesday. The prelevement of Iodine dated back from early august. So it does mean that it leaked for two months ? oooh by the way i don’t know if you knew it but genkai already leaked last year too..
Japanese nuclear plants are old, maintained by incompetent workers and administered following dubious work ethics. Even when they operate normally, the level of radioactivity in their neighbourhood is much higher than it should be. For instance, Matsue nuclear plant, outside the no man’s land, is near Miho Bay where 0.19 uSv/h was detected on August 16th (source: http://minnade-map.net/index.php). Readings along the Sea of Japan south of the Kashiwazaki nuclear plant are fairly high too. Sea spills occur regularly like oil tankers at large do, so it is not safe to live near a nuclear plant in Japan even when there are no incident. At the Tsuruga nuclear plant near Fukui, there was an incident in March 1981, drainage from unit 1 caused a release of radioactivity. The forty-day cover-up of a spill of 16 tons of radioactive primary cooling water was revealed only in April. I believe many such events are successfully covered-up and occur frequently. Incidentally, it also means that fishing and water sports like surfing in the Sea of Japan are hazardous activities, compounded by the general pollution issued by factories both in China and Japan. Of course, in the Pacific Ocean, it is suicidal. Data retrieved in Nagasaki indeed point out to your conclusion. Genkai (and several other nuclear plants in Japan) has a history of issues, one concerning a steam condenser as in the current problem. It may be a weakly designed component. Wikipedia offers a lot of information about these incidents in Japan and I had added this information at the end of the post concerning the Genkai plant. 1981: almost 300 workers were exposed to excessive levels of radiation after a fuel rod ruptured during repairs at the Tsuruga Nuclear Power Plant. December 1995: the fast breeder Monju Nuclear Power Plant sodium leak. State-run operator Donen was found to have concealed videotape footage that showed extensive damage to the reactor. March 1997: the Tokaimura nuclear reprocessing plant fire and explosion, northeast of Tokyo. 37 workers were exposed to low doses of radiation. Donen later acknowledged it had initially suppressed information about the fire. 1999: a fuel loading system malfunctioned at a nuclear plant in the Fukui Prefecture and set off an uncontrolled nuclear reaction and explosion. September 1999: the criticality accident at the Tokai fuel fabrication facility. Hundreds of people were exposed to radiation, three workers received doses above legal limits of whom two later died. 2000: Three Tokyo Electric Power Co. executives were forced to quit after the company in 1989 ordered an employee to edit out footage showing cracks in nuclear plant steam pipes in video being submitted to regulators. August 2002: a widespread falsification scandal starting in that led to the shut down of all Tokyo Electric Power Company’s 17 nuclear reactors; Tokyo Electric’s officials had falsified inspection records and attempted to hide cracks in reactor vessel shrouds in 13 of its 17 units. 2002: Two workers were exposed to a small amount of radiation and suffered minor burns during a fire at Onagawa Nuclear Power Station in northern Japan. 9 August 2004: four workers were killed after a steam explosion at the Mihama-3 station; the subsequent investigation revealed a serious lack in systematic inspection in Japanese nuclear plants, which led to a massive inspection program. 2006: A small amount of radioactive steam was released at the Fukushima Dai-ichi plant and it escaped the compound. 16 July 2007: a severe earthquake (measuring 6.8 on the Richter scale) hit the region where Tokyo Electric’s Kashiwazaki-Kariwa Nuclear Power Plant is located and radioactive water spilled into the Sea of Japan; as of March 2009, all of the reactors remain shut down for damage verification and repairs; the plant with seven units was the largest single nuclear power station in the world. It was only a matter of time before an event like Fukushima would happen, and it will not be the last. what happened to the new info? this is a good source of info, please dont stop now!!!!! Thanks for the encouragement, much appreciated. Fortunately, there has been less new info lately in what I call the “monitored land”. It doesn’t mean that it’s nuclear-free, as the name implies, we shall remain vigilant and monitor levels of radioactivity and nuclear issues such as the one that occured in Kyushu, for which I’ll post an update soon. Also, a monthly update of the situation is due. On the other hand, (bad) news still come from the no-man’s land, which I tend not to report if it doesn’t have a direct effect on the monitored land (for instance ocean contamination obviously has an adverse impact on it and would be followed up closely in SurvivalJapan). After all, there is a good reason why it’s a no-man’s land and it is widely covered by several other blogs. As the threat in the monitored land seems to recede, you rightly find that I posted less often – thanks again for your support and reading. Exa-Becquerel Now In Pacific Ocean ?